With digital photography, you can achieve whatever effect you desire, in-camera or with a few clicks of the mouse. So why then do people still bother with films and analogue cameras? MOPPING the sweat from his brow, Mohd Ariff Haji Mat Said plucks an antique-looking camera from his bulging backpack, cranks a knob back and forth, and points it at the trees above. A sound not unlike the crack of a whip follows – and a tiny bulb flashes. 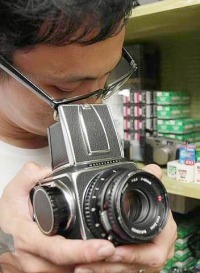 Mohd Ariff is using a Lomo LC-A (Kompakt Automat), a quirky 1980s camera that uses 35mm film. The photos the camera produces have a retro look about them – they are randomly grainy, blurry or come with a striking splash of colour. 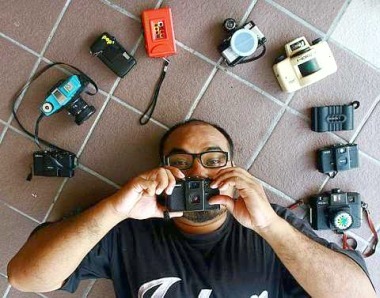 Mohd Ariff says Lomo enthusiasts revel in the fact that they are doing something out of the ordinary. With the Lomo camera, still life is like a box of chocolates. You never know what you’re going to get. In truth, though, these effects are easily replicated, post-snapshot, with the photo sharing applications of today. On Instagram, a free app on iPhone, for example, users can enhance their photos with a variety of special effects, layering images with a nostalgic tint, or casting shadows to add a gothic feel. The modified pictures can then be uploaded onto their Instagram feed, a platform that the New York Times has described as a “photo-only version of Twitter” and shared with friends. CNNMoney reports that an average of 10 photos is posted per second on the network. Since its introduction late last year, the app has attracted close to five million fans and continues to add almost a million users every month. With photography having been digitised, taking and processing pictures has never been easier than it is today. So why would anyone still bother to fiddle with an old-school camera? “Well, all I have to do is snap the shutter, and get what people can only strive to replicate in the computer,” Mohd Ariff explains. 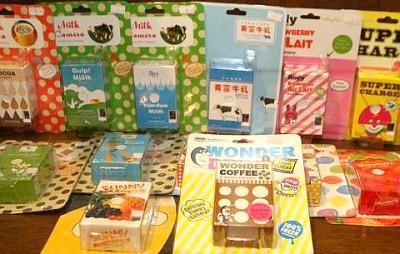 Quirky juice box film cameras sold at The Click Shop. Hailing from Ipoh, Perak, the 28-year-old government clerk admits that applications like Instagram have helped to spread the “art of lomography”, a term often used to describe the practise of capturing vintage-hued images with Lomo cameras. Lomo, a Russian creation, was rediscovered by curious Austrian students in the 90s, and ever since then, the brand has developed a global cult following. Suddenly, quaint toy-like cameras offering unusual photographic effects were in vogue — nobody could keep their hands off pretty-in-plastic gadgets whimsically labelled as Fisheye, Diana, Holga, Oktomat or Pop9, among others. The Lomo trend reached the shores of Malaysia in early 2000s, attracting its fair share of fans. But is lomography facing a slow but certain death in the wake of digital photography and apps like Instagram? Not a chance, says Mohd Ariff, a member of Lomokids Malaysia, one of a few communities of lomography enthusiasts in the country. Mohd Ariff believes that lomographers have found a satisfactory niche in going against the grain, as film cameras have become more and more alien to people. They revel in the fact that they are doing something out of the ordinary. But the enthusiasts are here to stay. 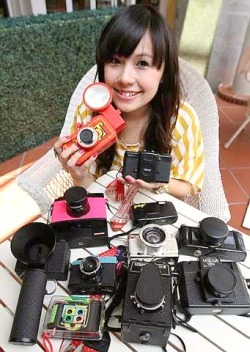 Eva Lai owns more than 10 Lomo cameras. When you use film cameras, you can’t be sure that the pictures you take will turn out well, or if they’ll turn out at all. You need some skills to operate them, and a whole lot of faith. This is totally unlike what you can do with digital cameras, which instantly let you see the picture you have taken so that you can reshoot until you’re satisfied. Nevertheless, it would seem anticipation — in this day and age where speed is king — can be fodder for the creative mind. “Digital photography is all about convenience, and with Instagram, it takes you less than two minutes to share a picture with your friends. With film, however, it may take two days, two weeks or even two months before you get to see what you’ve taken. But isn’t that a part of the fun?” asks Eva Lai, 26, online manager of the official Lomography Malaysia site (lomography.my). According to Edmund Li, 26, the “surprise” element is still very much a factor in film photography, especially with Lomo cameras. Li is the co-founder of The Click Shop (theclickshop.net) in SS2, Petaling Jaya, Selangor, which started out in 2009 as an online business selling all things Lomo and film-related. The shop recently expanded to include a brand new outlet in Tokyo Street, Pavilion KL. “Half the fun is in not knowing 100% what you will be getting,” Li says. “This way, we get double the pictures with one roll of film, which also means double the surprise,” says Lai, who has made friends with Lomo enthusiasts in Singapore, the Netherlands and the United States. Instagram can be addictive — in an instant, your images can convey the same vivid colours and quirky distortions reminiscent of pictures from your parents’ Polaroid days. The app has simplified what was once achievable only through Photoshop manipulation into the click of a button. Surely it’s a waste of time to still wield film cameras, when a “lomo-fi” filter is already among the many effects that can be found in Instagram? Lomographers apparently believe that their pictures are less artificial than digital images, truer in a way because they are produced when the shutter is activated. Film cameras to Justin Murugaya are about spontaneity and attitude. “When you edit a photo, you’re basically defacing it. The aspect of ‘captured art’ is no longer present,” argues Mohd Ariff. But that is not to say that lomographers can’t be Instagrammers, too — Lai and Li, for instance, fully support the convenience of the app. Instagram is used for sharing, they say, while lomography is a hobby. 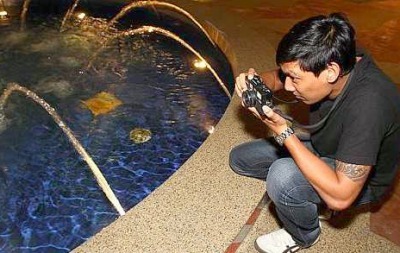 Wedding and portrait photographer Lai Kok Wei, 36, who has over 40 film cameras in his collection, admits that he’s often on Instagram just for fun. He uses a DSLR (digital single-lens reflex) camera on a daily basis, but what he likes best is the classic quality of film, especially those from his Hasselblad 500 C/M film camera. He claims it produces 3D-like images you can’t quite achieve with digital cameras. “I can enlarge the photos that I’ve taken on film and turn them into posters. But I can’t do that with low-resolution Instagram pictures,” he says. With his passion for black-and-white photography, Kok Wei’s film negatives are developed in the comfort of his own dark room, which gives him the privilege of being the first to see his own work. “One nicely taken film shot can sometimes be more beautiful than thousands of edited digital photos,” he says. Li thinks digital cameras, on the whole, have begun to inhibit the art of photography. “Digital cameras let you blast off thousands of shots in one go — you don’t really ‘see’ what you’re taking. With film cameras, however, you get to really take in what you’re shooting. When you look back, you will remember every single shot,” he explains. Since his last one “expired”, Li no longer owns a digital camera, and that’s perfectly OK with him. Digital photos tend to be about absolute perfection, says film camera aficionado Justin Murugaya, 32. “With film, it’s about spontaneity, and a bit of attitude — it’s the beauty of imperfection,” says the digital marketer. Justin may harbour a strong dislike for Instagram, but he cannot deny that the app has helped to focus attention on vintage-styled photos. “It goes to show that some things will never go out of style,” he says. Digital cameras and photo-sharing apps are fun and functional, but they are unlikely to substitute for traditional film photography. And with the Lomo brand now sprouting quirky designer cameras (Eva Lai has a Spinner that takes 360° pictures, and a La Sardina, which resembles a can of sardines), old-school cool will definitely continue to prevail for a while yet. Also, there’s nothing quite like holding a plastic camera in your hands. You can find Lomography Malaysia on Facebook.